There is a $15 registration fee for the event, payable through the WCA Stripe payment system. Your registration will not be confirmed (moved from the waiting list) until payment has been completed. There is a 130 competitor limit to the competition. Registration closes at the end of the day on June 3rd. We will grant refunds to those who let us know before June 3rd, but no refunds are granted after that date. There is a $15 registration fee, payable through the WCA Stripe payment system. Your registration will not be confirmed (moved from the waiting list) until payment has been completed. Please note that even after payment, registrations need to be manually approved before appearing on the registration list. There is a 130 competitor limit to the competition. We cannot have an extra round of 3x3x3, unfortunately, due to the fact that Gaston was held very close to this comptetition and it also had 3x3x3. NEW: If you plan on staying in the same hotel as the venue itself, you can get a Portland State discount on your rate. Just book at the link here and use the promo code "A1234" to receive the discount. Military, AAA, and AARP discounts are better than this though, so don't use this code if you qualify for one of those. The competition will be held in the Willamette Ballroom at the University Place Hotel on Portland State University's campus. Parking in the hotel's lot is $3 an hour, $12 a day, or $15 overnight. Many lots on the PSU campus offer a much cheaper hourly and daily rate. 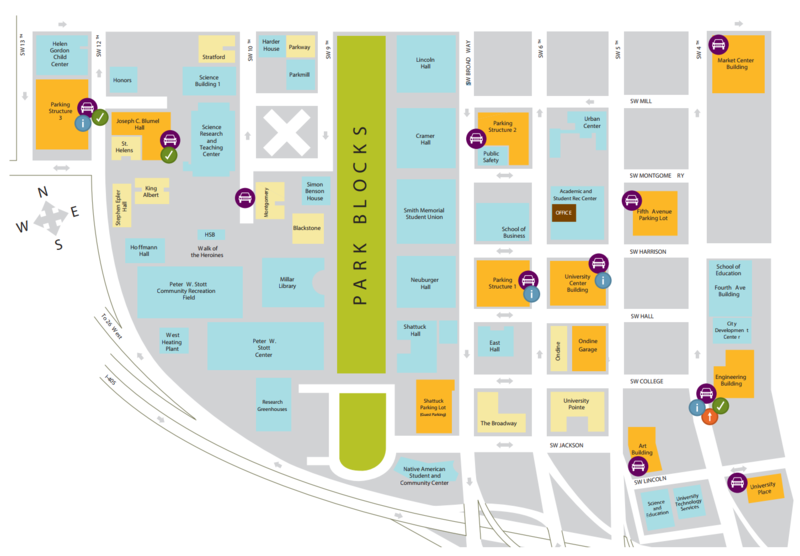 A map of available parking options on PSU's campus can be found here, and a list of rates for each of these locations can be found here. If you live locally, transit may be the easiest and cheapest option for you to come to the competition. The SW Lincoln St stop on the Orange line is right in front of the venue. The venue is also quite close to the Green line, and is two stops away from the Red/Blue lines. Several bus lines also serve Portland State. Check your transit directions using the map tool above. Gift card prizes will be given out to all who place in the top 3 of each event. For 3x3x3, the third prize is $15, second prize is $25, and first prize is $35. For all other events, third prize is $5, second prize is $7, and first prize is $10. Three additional $5 gift cards will also be given out for overall performance to those who did not finish in the top 3 in any other event.